In their new factory at Abingdon, and in the hands of the enterprising Cecil Kimber, the MG branch of the Morris 'empire' pioneered sports-car use of the small 6-cylinder overhead camshaft engine developed by Wolseley. 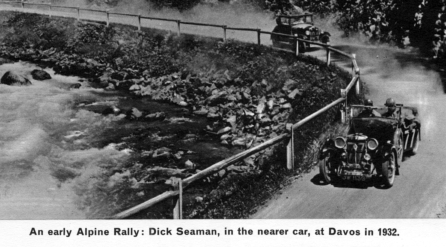 It was smoother and more powerful than the 4-cylinder version used in the 'M' type 'Midget' (and the original Morris 'Minor'), and was later developed for use in the renowned 'K' type and other 'small six' MGs of the '30s. Indeed, George Eyston's special one-off 'EX135' that went on to break so many speed records was initially referred to as the 'Magic Magna' in the press! The Latin meaning of 'Magna' as larger or more significant would not be lost on the well-to-do scholars of nearby Oxford. 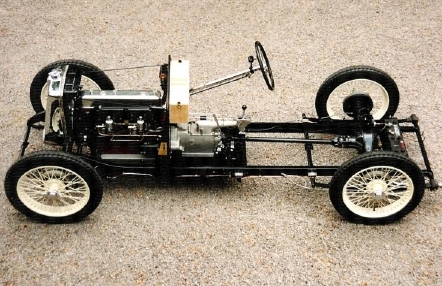 The ultra low chassis of the successful racing 'C' type or 'Montlhéry Midget' was suitably lengthened for the extra 2 cylinders of the 'F' type. (photo) At first, it shared the 4-seater and coupé bodies of the 'D' type Midget, but was often fitted with specialist 'bespoke' bodies (see other), and, in 1932, a 2-seater version with cutaway doors and a slab petrol-tank was introduced. This was also fitted to the 'J2' Midget and set the archetypal British sports-car style for many years. The wheelbase of the 'F' type was not only used for the successful 'K3' racer but also the 'L', 'N' and 'T' types, setting a pattern that only ended when the last of the 'square-rigger' MGs - the 'TF' - was replaced by the 'MGA' in 1955. A product of its era with a certain Art Deco style, the 'F' type MG is an interesting car. Despite advanced use of aluminium for its sump and valve cover, the engine had many dated features. Indeed the 'F' type marked a turning point, not only in MG fortunes, but in car engineering as a whole. Even outwardly, the characteristically period 'helmet' style wings gave way to 'motorcycle' ones and several examples had the swept wings that would be seen on later cars. Many changes were introduced in a relatively short production run - such as the larger brakes fitted to the 'F2', as the 2-seater was called, and the final 'F3' cars. It seems that at least one 'F3' was fitted with a 'J1' Tourer body as presumably the stock of 'D' type ones ran out. A couple of 'F' types were used as prototypes for the 'L' type and it has been suggested that the last of the 'F' types were actually converted into the first of the 'L' type production. There was probably more variety with this model than with any other MG, and the development that took place would benefit all later models. The fashionable, however, soon becomes outmoded, and although 'F' types still competed in Trials up to the Second World War, they were no longer 'the latest thing' and seemed to be looked down upon by those who liked to think themselves the 'cognoscenti'! 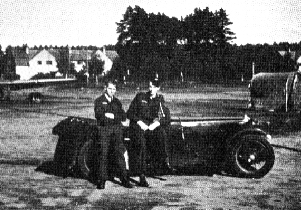 Those who drove them were happy enough despite problems maintaining the earlier 8" brakes and one example can be seen as the vehicle of choice for two wartime airmen. Many cars were retro-fitted with the 12" brakes and other modifications were made to 'modernise' the appearance or the mechanics. At least 2 cars were even fitted with independent front suspension, and various bodies were made to fit - as diverse as that from a scrapped Morgan to a tubular-framed Bristol racing one (F0355). Post-war years saw 'F' types being used for commuting and 'economy' student transport, but spares were becoming scarce and many cars were scrapped or taken off the road to be restored 'one day'! The earlier Wolseley Hornets provided some second-hand engine parts and those from other MGs and even Morris Minors would be pressed into service. The more distinctive bodies were a liability of course, and, until fairly recently, it was difficult to get body parts for even the Tourers. Rarer bodywork was even mistakenly thought to be 'unoriginal' by wiseacres who knew no better, and many unusual features were destroyed to make cars look like people's stereotype idea of an MG!